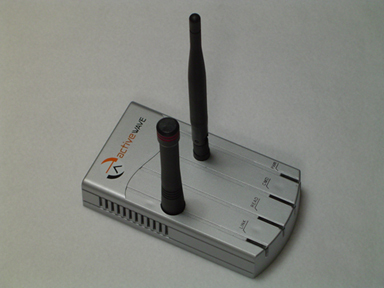 The ActiveWave Smart Field Generator is a small, efficient tag wake up device that communicates directly with the Reader. The Smart Field Generator transmits wake up commands to tags at 433 MHz. For broadcast commands, any tag within range of the Smart Field Generator will respond by transmitting its ID along with other information. For non-broadcast commands, only the specified tag(s) will respond. Because the Smart Field Generator supports 916 (927,868) MHz communications, it can communicate directly to the Reader. This presents several advantages over our Standard Field Generator. When the Smart Field Generator is first powered, it automatically sends a power-up message. This message is sent to the Reader, then relayed to the Host. The Host immediately displays the Smart Field Generator's address and allows the user to change it. ID - Address of the Smart Field Generator. Assigned Reader ID - Address of associated Reader. Operating Modes - Continuous on/off period, motion triggered, or immediate Tag Call via Host. Tag Call - Specify tag ID, tag type, or all tags (broadcast). Field Strength - Adjust RF coverage area wirelessly. The Smart Field Generator has three modes of operation. The Field Generator periodically turns on and calls tags for a specified time, then turns off for a specified time; the Field Generator is turned on by a motion sensor as soon as movement is detected; or the user can call a specific tag ID, tag type, or all tags at any time. This last feature is very powerful because it allows the system to search for specific tags at any location at any time. The transmit field strength is adjustable wirelessly to control the size of the coverage area. Indicators Red LED On while transmitting/receiving packet to/from Reader. Green LED On while transmitting packet to tag.